Palestinian Jenan Barghouthi worked hard to reconstruct her life and get back to work in the West Bank city of Ramallah following a spinal cord injury in 1999. 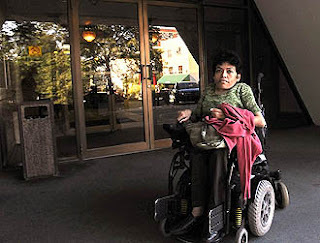 For five years, she experienced the daily frustrations of living and working in an environment that makes little provision for people who use wheelchairs. She became active in efforts to raise awareness of disability issues in her society and, in 2005, accepted an opportunity to come to the University of Pittsburgh to pursue a master's degree in rehabilitation counseling. But even with the degree she will complete next month, Ms. Barghouthi, 41, says she cannot put her knowledge to use in Ramallah or any Palestinian city because the physical environment remains inaccessible, attitudes toward people with disabilities are limiting and the political situation is unstable. Consequently, she has been seeking a job in the United States in the hope of remaining in the country beyond the term of her student visa, which expires in September. Upon arriving at Pitt three years ago, Ms. Barghouthi intended to return to Ramallah, a city of 57,000 people, to improve conditions for others with disabilities, and she still hopes to do so at some point in the future. But for now, she says, the landscape is so unfriendly to people with disabilities that she would not be able to live with any degree of independence, much less work. "I would like to go back to change the situation, but I find that even I would be disempowered," she said. "Access has not improved; it has gotten worse." Three years of living in Pittsburgh has shown her what it means to live in an environment that is generally accessible, even with its older buildings and infrastructure.